Widget to look up keyboard shortcuts. Is there a better alternative to xCuts? Is xCuts really the best app in Finance category? Will xCuts work good on macOS 10.13.4? 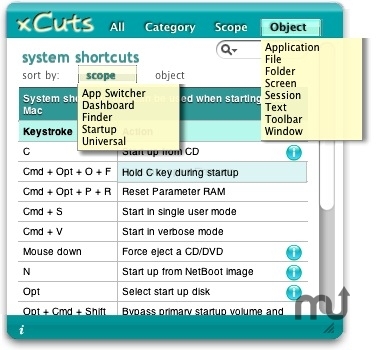 xCuts is a utility for looking up Mac OS X keyboard shortcuts. Besides its comprehensive set of Mac OS X shortcuts, xCuts also covers some other applications, such as Quicksilver and Microsoft Windows. Fixed code that was causing xCuts to consume unnecessary CPU cycles even when idle. It should now run with 0 CPU usage when idle. Also fixed code that made it possible to lose the bottom bar of the widget (including the drag icon) while resizing it. In the process, I made xCuts somewhat slimmer vertically. xCuts needs a rating. Be the first to rate this app and get the discussion started!